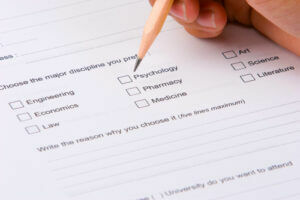 Using a pencil to choose a major on questionnaire. Photo courtesy of Shutterstock. Most of us were told as children that we could be whatever we wanted to be when we grew up. As time goes on, most of us tend to realize that the truth is slightly more complicated. Employers, how can you get the most out of your young professionals with entry level jobs? Consider three management tips to apply from the gaming world in the following post. How Would You Like to Write for a Video Game? If you’re a gamer, how many times have you sat down and read the bio of one of the characters you wanted to use? Did you ever wonder who wrote the back stories for characters like Sonic the Hedgehog, Lara Croft, or Super Mario Brothers? Did you ever think you’d like to be one of the people who wrote the story lines for video games like Resident Evil or the Final Fantasy series? Well, guess what … if you’re a writing major, that idea isn’t as far out as you might think. Interactive-media writer, Carol Handler Miller, tells writers and aspiring writers how to expand their professional horizons in a really cool way. In her article for the December 2008 issue of The Writer magazine, Miller explains the job and advises on how to break into the industry.